That's a really nice example. 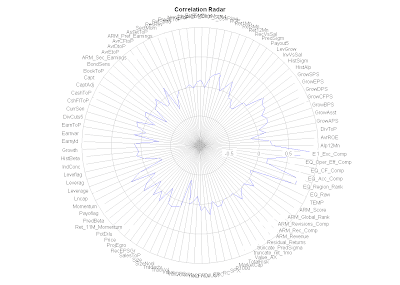 I have to say though, that I found radial plots in most cases a bit confusing. Isn't it better to show this data using for example a dotchart? I like the radial plots if there is some angular meaning behind the variables like for wind strength for example. For data like these I guess the order (hence direction) is not relevant. On a dotchart you could plot them ordered alphabetically or by the variable value, wouldn't be more readable? What do you think? Thanks for the point, I agree with you. The post was only meant as an example (thanks again to David) depicting how to produce this kind of plot in R, nothing more. If you think to have a dataset better suited for this kind of visualization, fell free to post it here. RXKCD: display your favorite XKCD comic strip directly from R.
RColombos: Interface to Colombos Compendia using the exposed REST API.